Sachin Tendulkar has always played like a King, growing from a gifted prodigy to a seasoned run-machine, deciding the pace of countless games with a master’s touch and adapting seamlessly to changing situations. Apart from the remarkable victory that India scored against arch rivals Pakistan at the World Cup Semi-finals, marked by jubilant celebrations all over the country (which has already been discussed threadbare and analysed to its elements at numerous news reports and blog posts), a significant aspect of the match was that Sachin Tendulkar, the Superman of Indian cricket, stopped short of marking his one-hundredth Century in cricket. And this is significant in more ways than one. For one, it was a burning desire by the legions of cricket fans in the country, that India outplay Pakistan in the all-important Semi-final match and cruise along to the Finals, to meet Sri Lanka at Mumbai on Saturday. More than the lure of the World Cup was the lust for victory against India’s neighbour with a long, shared history of international relations that blew hot and cold. Then, there is the nagging accusation, which people have hurled at the Master while drawing a rather sadistic pleasure, that Sachin fails invariably to perform in high-pressure games and crisis situations – it eludes logic if he is expected to cease being a mere mortal and start brandishing celestial powers, if he has not done so yet on his opponents, to be able to silence his relentless critics – and he doesn’t have many records left to break anyway! 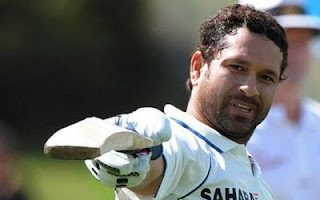 Further, there is this superstitious belief in the canons of India’s national religion that the team would somehow fail at the expense of Tendulkar’s ton – “whenever Sachin has scored a century, India has struggled or lost the game”! Leaving the host of projections of the human mind indulging in an endless streak of analytical adventures aside, perhaps the most significant aspect about the way Sachin left the creases without disturbing the record books yesterday at Mohali, is in his not creating history punctuated with a dubious record. There has never been such a miracle in the History of the game that someone has been so ruthless and dealt so many opponents mercilessly, to score a hundred hundreds! And it is only once that Sachin Tendulkar would be crowned with such a glory in the arena of International Cricket, with a record that had not even been fancied by anyone before he steadily approached the daunting landmark, never slogging but crafting his path with strokes of elegance and grace. Given the grandeur of the occasion that the entire world would not have an option but to stop and applaud, why would he want to strain his own record books, by creating history with as many as four dropped catches and a couple of referrals (which were not lives anyway)? Tendulkar’s “lives” are already among the most talked about topics since yesterday, something that the Master Blaster has seldom been associated with. And his detractors would have already smelt blood, even as the Pakistani team was busy, inexplicably spilling rather straight forward catches at regular intervals. The commentators would refuse to admit that they had misread the wicket even as the much-awaited (and media-hyped) game began, calling it a batsman’s paradise, as the ball kept crawling inches above the ground and stopping in its track, falling well short of the keeper's gloves on many an occasion, as if the leather had been drenched and soaked in a tank full of water. As batsmen of both the teams fell helplessly, without a clue, deceived by the wily nature of a deceptively lifeless track, the wise men with microphones would rather blame the travails on pressure and the situation, shovelling it all under the convenient label of “nerves”, sticking to their guns rather than acknowledging the appalling nature of the cricket pitch. And it is not just in such difficult terrain as in the semi-final match alone that Sachin has topped the scorecard, and eventually making the difference between an Indian victory and defeat. Sachin has always played like a King, growing from a gifted prodigy to a seasoned run-machine, deciding the pace of countless games with a master’s touch and adapting seamlessly to changing situations. The crowning jewel in his collection of records deserves to be sublime, free from the strains of dropped catches and revoked decisions. For someone who has made India proud with his sparkling class, we could all wait for his moment of virtually insurmountable glory!